Dominick Figliomeni came to the United States from Italy in 1997. Despite knowing little English, he quickly learned the opportunities afforded by American entrepreneuralship, and 18 years later owns three area barber shops in Clifton Park, Halfmoon and Loudonville (and speaks the language very well too!) 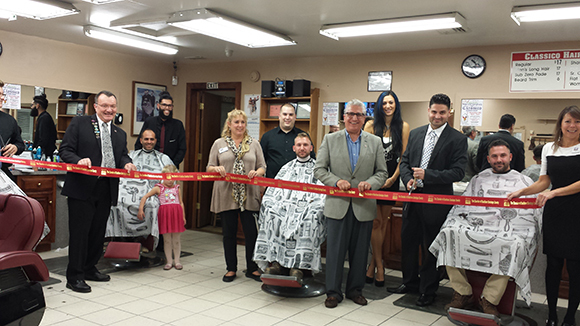 The Chamber of Southern Saratoga County (CSSC) celebrated the new ownership at Classico Barbershop in Halfmoon (1521 Route 9, 518-371-3332), his latest location, on November 6 by fittingly cutting the ribbon right across the barber chairs, joined by several customers! Pictured are (R-L) Chamber of Southern Saratoga County President/CEO Pete Bardunias, Albany residents Jeremy and Nora Khachadourian, Demetrius Londis, Kate Gardiner, Donna Connor, On the Go Concierge; Nick Kayser; Waterford resident Chris Sager; Assemblyman Jim Tedisco, Jeanie and Dominick Figliomeni of Classico Barber Shop, Hazleton, PA resident Mike Ghetti; Sandy Hassfurter, Berkshire Hathaway Home Services.